How Much Does a Radiology Technician Make per Year? Radiology technicians, also known as x-ray technicians, radiologic technologists or radiographers, specialize in computed and x-ray tomography imaging and perform diagnostic imaging examinations. A radiology technician working in the US will earn about $42,190, less than one working in Australia (AU$67,111 or US$50,715), or New Zealand (NZ$65,000 US$45,363). The US is only followed by the UK with £28,462 (US$35,433) per year, Canada with C$67,000 (US$49,871), South Africa with R227,983 (US$16,540), and India with R227,983 (US$16,540) per year. As with most jobs in the medical sector, a radiology technician salary can vary from state to state, from industry to industry depending on the employee’s level of experience. In the United States, the average salaries for radiologic technicians can be around $55,000, although they are influenced by many factors. According to bls.gov, health technologists and technicians (including radiology technicians) earn on average $42,190 per year. The starting salary for a radiology technician in the US is around $35,000. Experienced professionals, on the other hand, can reach a salary of $81,660 or more. Nevertheless, only 11% of the professionals currently working in this field have more than 20 years on the job. In fact, more than half of the x-ray technicians in the US have 5 years of experience or less. About 30% of the radiology technicians have no type of health benefit with their job. Of course, the geographical location of the job also decides the salary for radiology technicians. Some states will pay more than others, and other states will offer more jobs. Therefore, it can be difficult to find a job in an area that is hiring and pays particularly well. The radiology technician salary in Canada averages at C$56,550 per year, or US$42,129 yearly. A beginner in this field can start off at about C$31,443, or a little under US$23,500; they will reach the national average in 5 to 10 years. Nevertheless, if one chooses to stay in this field for more than 10 to 15 years, they will take home around C$71,517 (US$53,294). Among all the radiology technicians currently working in the US, about 67% have medical, dental, and vision insurance; the other 33% don’t have any type of health benefits with their job. The average salary of a radiology technician working in the United Kingdom is £28,462, or US$35,433. According to SalaryVoice.com, the starting radiology technician salary in the UK as little as £16,459 (US$20,483) in some areas. The same source estimates yearly incomes for professionals with 3-8 years of experience to earn between £19,634 (US24,434) and £35,746 (US$44,460). After 10 years on the job or more, an x-ray technician can expect to reach an annual salary of £40,097, or just a little under US$50,000 (US$49,907, to be precise). Radiology technicians working in the healthcare system usually earns between £21,187 (US$26,352) and £39,967 (US$49,710). As mentioned before, the salary of a radiology technician in Australia is set at AU$67,111, or US$50,715. However, a professional with less than 5 years of experience in this field will earn about AU$40,617 (US$30,674), while one with more than 15 years behind will take home about AU$89,323, or US$67,421. In addition, overtime will be compensated with anywhere between AU$37.18 (US$28) to AU$79.46 (US$60) per hour. Considering the average hourly pay for this profession is AU$32.26 (US$24.38), it’s understandable why many choose to work overtime. 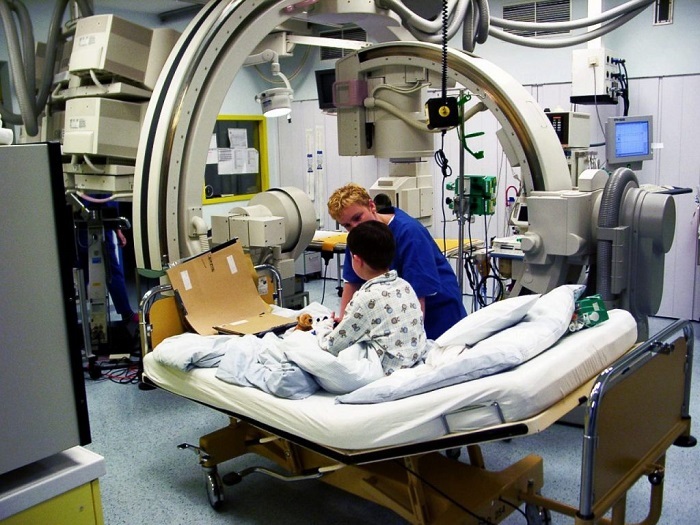 New Zealand’s healthcare system defines radiology or x-ray technicians as medical radiation technologists, together with professions like Diagnostic Imaging General Technologist, Magnetic Resonance Imager (MRI), Medical Imaging Technologist, Nuclear Medicine Technologist, Radiographer, and Sonographer. Therefore, the average salary of a medical radiation technologist is about NZ$65,000, or US$45,363. A beginner in this field will take home at least NZ$49,000 (US$34,202), while an experienced professional can earn up to NZ$95,000, or US$66,300. In addition, the demand for these professionals is increasing in New Zealand, which makes the chances of employment well above average. The average salary of a radiology technician is Rs183,120 or US$2,810 per year. According to VivoHealthcare, the starting salary of a radiology technician in India is Rs84,000 per year, or roughly US$1,288. In 5 years tops, a health care professional working as a radiology technician will reach a yearly salary of Rs120,000 (US$1,841). Experienced professionals working in India for more than 15 years can expect salaries of up to Rs442,000, or US$6,803 per year. In addition, bonuses can account for an extra Rs9,000 or US$138 per year. Nevertheless, most of the radiology technicians in India (65%) have less than 5 years of experience. As for the benefits, more than half of the professionals working in India (64%) have medical insurance, 7% have dental and vision, and 36% have no type of health benefit with their job. Even though there is no information available about the radiology technician in South Africa, we can take the radiology technologist salary as a reference. Therefore, a radiology technician earns R227,983 (US$16,642) on average. The starting salary for a radiology technologist in South Africa is ZAR143,503, or US$10,493. In time, an experienced professional will get to take home ZAR314,913 (US$23,020). In addition, bonuses can account for another R3,103 – R19,858 (US$227 – US$1,452) to their yearly incomes. Cape Town-based radiology technologists usually earn more than their colleagues, between ZAR140,532 (US$10,285) to ZAR353,915 (US$25,944). The second-best salaries for radiology technologists in South Africa are found in Durban, where they range between R171,488 (US$12,573) to R302,017 (US$22,144). They’re closely followed by Johannesburg at R144,000 (US$10,539) to R280,000 (US$20,525). Experience doesn’t affect the salary of a radiology technician all that much throughout a country. Sure, raises can be offered at any point by a benevolent employer, but they are seldom guaranteed. The highest salary increase for the position, reported in 2013, was limited to $15,000 for the US. Of course, the industry which an aspiring radiological technologist calls the starting point of their career also plays a big part in their future career path and in their salary. In fact, the geographical location has a smaller influence on the radiology technician salary than the industry in which they start working. According to a study performed in Boston, NY, in 2013, the average full-time radiology technician works 40-hour work weeks. Back then, it was rare for their work weeks to vary too much or for them to get the opportunity to get paid extra. According to more recent reports, however, radiology technologists could have on-call, evening, or weekend hours on the job. This greatly increases their chances of performing overtime and earning more money. More opportunities for shifts and part-time jobs have also been popping up in recent years. Of course, the working hours also vary after each country’s legislation and healthcare system. Because of the mediocre pay in most English-speaking countries, a radiology technician salary often ends up being not nearly enough incentive to keep an employee interested for too long. This is why there are usually plenty of opportunities and incentives meant to keep them onboard. Below, you will find a list of some of these benefits. While the job is certainly not underpaid, with the average salary being well over the minimum wage, some might consider the risks not being worth the reward. However, the benefits and opportunities of switching fields and jobs are certainly worth it on the long run. There is a 9% percent growth in employment in the field predicted to take place by 2024, therefore paying the time and money for the associate’s or bachelor’s degree in radiology and trade school diploma necessary for the job is a very sound investment. One can easily switch up their job description from a technician performing CT scans to dealing with ultrasound or MRI devices. This is known as cross-training. Overall, even if the radiology technician salary might seem small to some, all the associated benefits and job outlook might determine no small number of aspiring employees to start looking for jobs in the field. Even though the radiology technician salary is above average in some English-speaking countries like the UK, New Zealand, or India, some others offer salary packages that are below the national average for their country. Nevertheless, there are plenty of career opportunities that come with this job for those who are willing to invest time and finances into their education. If you are interested in the medical tech field, you can also check out our article on the ultrasound tech salary.